Apep is one of the minor gods of chaos in the Egyptian pantheon. (Don’t tell him he’s a minor god, though, that is a sore subject!) He is reptilian, and his job is to sow discord in the world. Apep, how did you first meet Columbkill? I suppose it was just after the great battle with Bastet. She came around, asking a lot of questions, trying to find out what happened. Pretty nosy, really. Well, like I said, she’s nosy. And she seems to not like chaos and discord much, too. Who doesn’t like chaos and discord? So weird. I’m in a lot of books, since I’m so very important, you know, so it doesn’t surprise me that I’m in this one. I’m on a bunch of hieroglyphics, too, just so you know. Well it’s certainly not the battle scene, that’s for sure! Why, sow discord and chaos, of course! That’s what being a god of chaos is all about. My favorite thing is to try to keep the sun from rising every day. I’ve never been able to stop it, but one day. . . I sort of hate them, really. Do-gooders, judgmental namby-pambies…I really don’t have anything nice to say about them. Of course I really don’t ever have anything nice to say, as a rule. If you had a free day with no responsibilities what would you do? I’d probably just go around causing arguments, making people mad at each other, trying to end the world…you know, the usual. Oh, and maybe go on a reality TV show. I think I’d be pretty good at that. People tend to be afraid of my fangs. They think I’m going to eat them. And sometimes I do. And I’m really not sure what they think of me after I eat them. I’ve never asked, and I doubt they’d answer if I did. We’re back to the battle again. 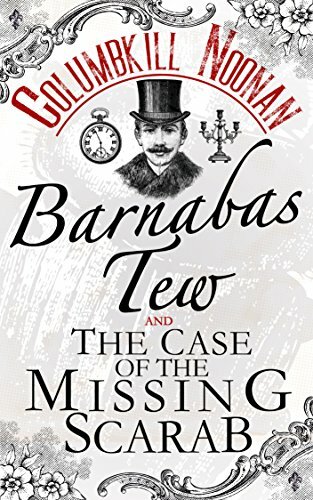 I learned to never underestimate a nervous little Victorian detective again. And cats. I learned I really don’t like cats. Tell us about your best friend. I don’t have any friends, because I’m a god of chaos. Gods of chaos don’t really do friendship, you know? Cats. Really, can we stop talking about this? The best trait she gave me was my pure evilness. She really did a good job capturing that. Nietzche, for sure. He’s so depressing. Will you encourage Columbkill to write a sequel? Only if she lets the dark side win for a change! What’s with all the “good triumphing over evil,” anyway? It’s not fair, if you ask me. Columbkill Noonan lives in Baltimore, Maryland, USA, where she teaches yoga and Anatomy and Physiology. Her work has appeared in numerous anthologies and magazines. 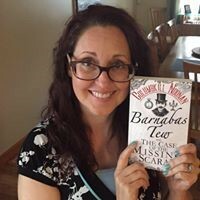 Her first novel, Barnabas Tew and the Case of the Missing Scarab by Crooked Cat Books, was released in 2017, and her latest work, Barnabas Tew and the Case of the Nine Worlds, is set to be released in September 2018.